What’s the best way to ensure a successful a Kickstarter campaign? How do I self-distribute, or digitally distribute my film well? What should I post on my Facebook page as opposed to my Twitter feed? What if I’m not on Twitter? For the filmmakers who attended the IFP/Film Presence/DCTV panel on social media for filmmakers on April 26, 2012 in New York City, the above questions could all be summed up with one answer that was emphasized and then re-emphasized by every member of the panel discussion: Engage your audience. Seems simple enough, yet many people — filmmakers or not — fail to see that simply posting content relevant to your project or career will not necessarily engage an audience and get them interested. Just throwing a trailer up somewhere will not ensure that many people will watch it, especially when you are competing with a wealth of viral videos and blog posts that are crowding everyone’s Twitter and Facebook feeds. So now that filmmakers have a focus, how should they go about achieving that engagement? There were a variety of tips and tricks coming from the panel, which featured Elisabeth Holm of Kickstarter, filmmaker Gary Hustwit (Helvetica, Objectified), Julie La’Bassiere of the Cinetic digital sales arm FilmBuff, Mike Knowlton of the interactive studio Murmur (Him, Her and Them) and the storytelling non-profit StoryCode. Film marketer Sara Kiener (Film Presence) moderated. First and foremost. No one wants to connect with at spam bot, or with something that seems like a shameless self-promotion. Whether its on your Kickstarter page, in your tweets or on your Facebook, write in your voice and make the audience feel like they are experience a human connection. As Elisabeth Holm put it, “We are all on the Internet starving for human connection.” No one wants to back a project or engage in a conversation with a film seemingly being made by a robot without heart. Gary Hustwit and Julie La’Bassier even took this one step further in suggesting that filmmakers should not create Twitter handles for a specific film. The majority of people on Twitter follow individual people over projects anyways. So, create a Twitter handle for yourself and use hashtags to refer to individual films. This will help build an audience in one digital space which you can tap into for future films, helping the sustainability of your Twitter presence and influence. 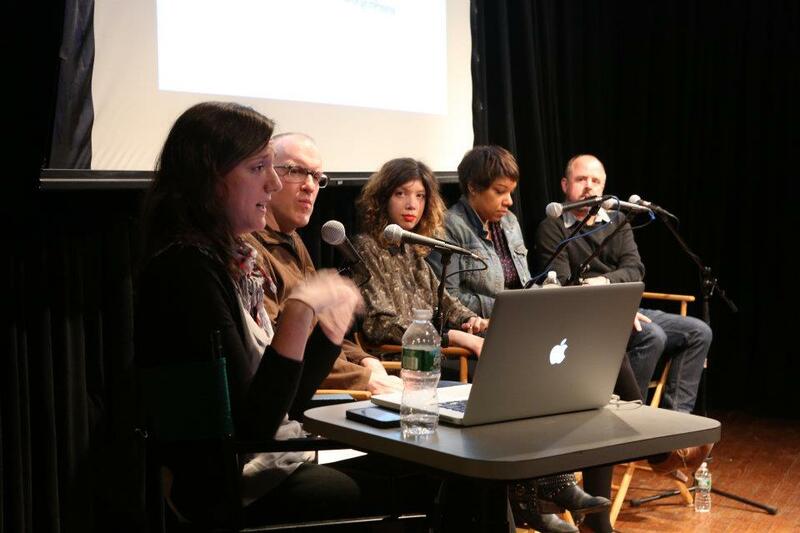 Documentary filmmakers are in a unique space in the digital realm in that the subjects and issues they deal with typically already have a strong community and dialogue online. Tap into those conversations, not by simply saying, “Watch my doc!” but by posting your interests and viewpoints, maybe giving some anecdotes. Engage and stay on top of the conversation because others will take notice and see that something is happening. The people you attract through this type of interaction are going to be more motivated to see your film because they feel like they know you and will be interested to see what you have to say at the end of your project. If you think it is suited to your project, tap into transmedia strategies and the possibility of expanding your stories over multiple platforms. Mike Knowlton provided an example of an initiative from the narrative film The Sound of My Voice, where the filmmakers released the first 12 minutes of the film with embedded buttons and social media links within the viewer window before the premiere. These links jumped off to other content on YouTube, essays, photos and more, which built excitement around the project and expanding the film’s presence online through sharing on social networks. On the subject of distribution, La’Bassier said she’s worked with too many filmmakers who want their film to be on every platform and everywhere. If you are making a film about young hip-hop artists who struggle to make it during the trials and tribulations of coming of age, why waste money marketing it on Amazon, where the demographic might be mismatched? Once you’ve garnered interest in your film by “fishing where the fish are,” you can you expand your audience on universal platforms. Your Twitter feed should never look like this: “3 weeks till our film is on iTunes!,” “In 3 weeks you will be able to get our film on iTunes,” “Excited for our film?,” “Another week down, you will have it soon.” In other words, don’t talk at your audience. Instead give them something to do. Maybe post related content online, whether created by you or not, so that they become interested in your Twitter handle and then will be prompted to download your film once it is out. Audiences want to be prompted with an action, not with a wait. Filmmaker Gary Hustwit explained that many times he has tweeted or posted asking people “Hey Portland, what’s the best indie theater by you?” or “Should we have a screening at this theater, or is there some place cooler?” which then sparks dialogue about your film screening and builds an engaged audience that will be ready to go when you finally announce your screening. Also, filmmakers can ask for suggestions on where to find shooting locations, if anything related to your topic is happening in their community, and even if crew members are available if you need them. You audience will now feel like they have something invested in the success of your film and will in turn evangelize your film through their own social media outlets. In the end, it all comes down to making your audience feel like they mean something to you, and they should. They are the ones who you are counting on for the success of your film, so show them a little love! This post was originally published on the POV blog (pbs.org/pov/blog). Sean Holmquest is a Producer in POV's Digital Department where he creates features for the POV film companion websites and manages online video content. Prior to joining POV in 2010, he worked as a freelance film editor and writer, in addition to holding a position as an assistant for an independent music artist and interning with a Hollywood production company. He has written and directed several short, experimental films, and holds a bachelor's degree from Brown University in Literary Arts. I am an aspiring filmmaker who is currently crow funding on Indie Gogo.com and HelpersUnite.com for a silent suspense thriller called The Collector. A portion of the proceeds will go to the charity RAIN. My reason for writing is to find out what, if anything, your organization can do to help me raise funds for their projects. Any advice and/or support will be appreciated.